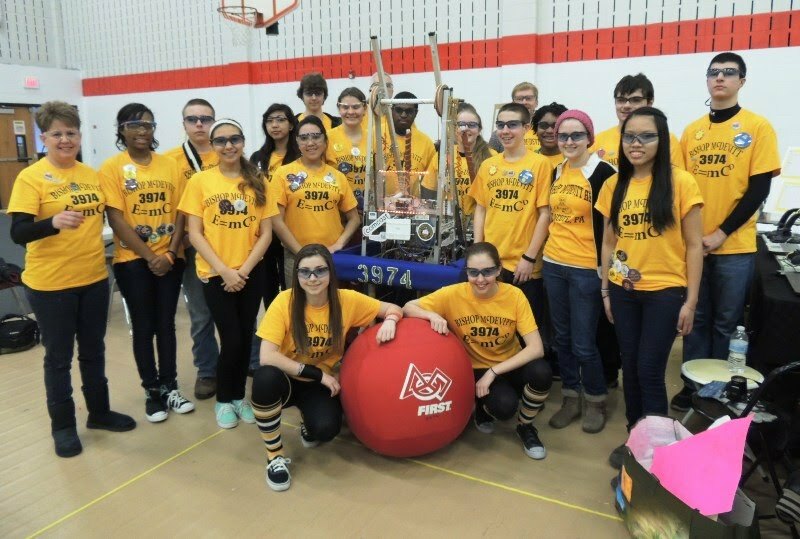 The McDevitt Robotics team completed our first of two district completions with excellent results. We began the competition on a high note when we were surprised with a gift of flag banner from the Gwiszcz family. It is a tradition at competitions that when teams are in introduced the announcer shows the team flag. Before this event we were unable to participate, now we can. Thank you Gwiszca family!!!!!! Here is our robot (3974) ready for the start of a match. The first phase of each match is autonomous mode, where the robot operates with just pre programmed instructions and sensors. Good teams have the ability to adjust during the competition. We had trouble and missed 3 of our first 4 shots. The team decided to change the software program mid tournament and following the adjustment we made the next 5 in a row. The completion this year is very brutal. With only one game piece and no safe zones the robots are pushing, pulling and crashing into each other in an effort to grab the ball, smash it out of the opponents possession or cause them to miss the shot. A successful robot must be very robust. Many robots missed matches due to damage. We had our share of problems, our spinner was broker completely off twice, but we were prepared with spare parts and always made repairs in time. Here is some of the damage we suffered. We had many visitors this week and team members are very proud of the robot and are happy to explain how it works. Thank you all for coming. Below Paul Schlosser from our sponsor Lockheed Martin poses with a few team members. Paul brought Lockheed Martin pin for the team which we are proud to wear. Below is Bill Green broke our lead driver who broke his collarbone recently. Another team member Alex Wilson supported Bill by jumped in and driving for some of the matches. 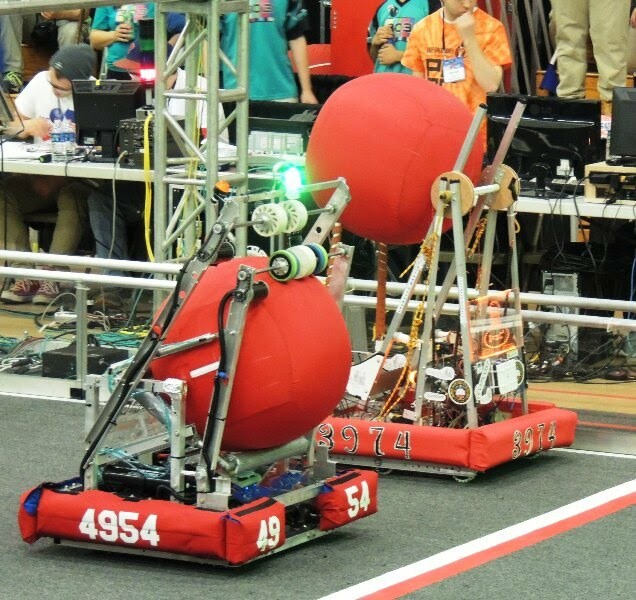 Bill drove the robot in ½ of the matches despite his injuries. We are proud of both for their dedication to the team. Not all the action is in the field, team members in the stands cheering on the robot and the drivers. We finished the qualification matches with a record of only 5 and 7 but we played the game very well. Our ability was recognized and we were chosen to join the 4th seeded alliance for the elimination round. In the quarter finals we defeated the 5th alliance 2 - 1 but lost in the semi finals to the 1st Alliance (and eventual champions) 2-0. We finished the tournament with 24 qualification points toward the regional championships to be held at Lehigh University. We will have to do well again at our second district competition at Springside-Chestnut-Hill to reach Lehigh. We hope to see you at the Springside-Chestnut Hill completion on Friday March 14th or Saturday March 15th. It is a free event—if you come find us in the stands or in the pits (each team gets a space –reminds me of the Indy 500) so the students can tell you all about the robot.